Deputies said Cockefur wailed his hand around on purpose causing blood to fly around. They say Cockefur did not cooperate and continued to be combative. He yanked out the stitches to his hand. When you go to an emergency room, waiting is usually part of the process, but officials say that is not the case at one Eastern Kentucky hospital. St. Joseph Martin in Floyd County now has a no wait emergency room. Waiting is almost always an issue in most emergency rooms. “If you’re sick enough to come to an emergency room, then you really don’t feel like waiting,” said Kathy Stumbo, the President of St. Joseph Martin Hospital. But not at St. Joseph Martin. They now have a no wait emergency room. Got four hours to spare? Not many of us do. Our days are already crammed with work and personal responsibilities. We’re on the go, and time is precious. Yet four hours is the time we spend for an average emergency department visit. And much of that time is spent waiting for a doctor, a room or paperwork. It’s a serious problem that calls for serious thinking. Is Advanced Life Support better than Basic Life Support in prehospital care? Prehospital care is classified into ALS- (advanced life support) and BLS- (basic life support) levels according to the methods used. ALS-level prehospital care uses invasive methods, such as intravenous fluids, medications and intubation. However, the effectiveness of ALS care compared to BLS has been questionable. Aim – The aim of this systematic review is to compare the effectiveness of ALS- and BLS-level prehospital care. Material and methods: In a systematic review, articles where ALS-level prehospital care was compared to BLS-level or any other treatment were included. The outcome variables were mortality or patient’s health-related quality of life or patient’s capacity to perform daily activities. Results: We identified 46 articles, mostly retrospective observational studies. The results on the effectiveness of ALS in unselected patient cohorts are contradictory. In cardiac arrest, early cardiopulmonary resuscitation and defibrillation are essential for survival, but prehospital ALS interventions have not improved survival. Prehospital thrombolytic treatment reduces mortality in patients having a myocardial infarction. The majority of research into trauma favours BLS in the case of penetrating trauma and also in cases of short distance to a hospital. In patients with severe head injuries, ALS provided by paramedics and intubation without anaesthesia can even be harmful. If the prehospital care is provided by an experienced physician and by a HEMS organisation (Helicopter Emergency Medical Service), ALS interventions may be beneficial for patients with multiple injuries and severe brain injuries. However, the results are contradictory. Conclusions: ALS seems to improve survival in patients with myocardial infarction and BLS seems to be the proper level of care for patients with penetrating injuries. Some studies indicate a beneficial effect of ALS among patients with blunt head injuries or multiple injuries. There is also some evidence in favour of ALS among patients with epileptic seizures as well as those with a respiratory distress. Rescue crews had to use ropes and ladders to retrieve a western Pennsylvania woman from her pickup truck after it ran off a road and landed in tree tops about 30 feet above ground in a ravine. 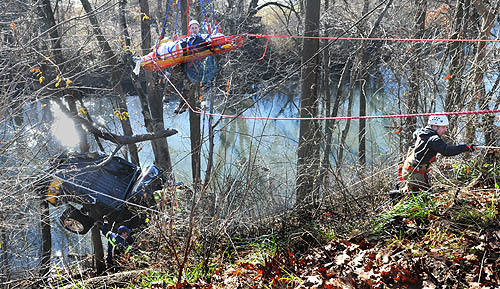 Firefighters used a ladder truck and ropes this morning to rescue a woman from her truck after it sideswiped another car on Route 68 north of Evans City, careened over the guardrail and landed among trees high above Connoquenessing Creek. Erin Dawn Bowser, 33, was conscious and talking to rescuers as they extracted her from her smashed Dodge Ram. A witness said Ms. Bowers’ truck was speeding on Route 68 at about 8:30 a.m. when it fishtailed, struck her Cadillac from behind and sailed about 100 feet into the woods. Wheaton Franciscan officials said their urgent care center offers services beyond normal urgent care clinics, including around-the-clock availability. “There’s no general consistent definition of urgent care. Ours is more like an emergency department,” said Coreen Dicus-Johnson, senior vice president of physician and revenue operations. However, no ambulances take patients to the urgent care clinic, and no emergency surgery is performed on site. In contrast, most urgent care clinics are seen as an extension of a doctor’s office and bill at comparable rates. That’s the type of service most patients think of when they hear “urgent care,” said Kevin Behl, who oversees Columbia St. Mary’s Cathedral Square Urgent Care Center in downtown Milwaukee. “It’s supposed to be an alternative to an emergency room,” Behl said. Although Wheaton Franciscan’s clinic is licensed for urgent care, the health care system contends it provides a much higher level of services, and that necessitates higher prices. The FDA is alerting healthcare professionals about potential problems with prefilled, needleless glass syringes used to deliver adenosine or amiodarone in patients with cardiac arrhythmias. Some of these syringes appear to be incompatible with certain needleless intravenous access systems, the agency said, causing the syringes to break, malfunction, or become clogged while attempting to connect them. The agency says most of the reports were related to adenosine, used to quickly normalize a rapid or irregular heart rhythm. A few reports involved prefilled syringes of amiodarone, another IV drug used for cardiac rhythm problems. “In some cases, the syringe may damage the IV tubing and/or the needleless connector and require re-establishment of intravenous access. These failures can cause a delay in administration of the medication,” according to an FDA letter to healthcare professionals and other stakeholders. Because the products may be needed in emergency situations, delays can result in “serious harm to patients,” the agency warned.